This is called a Jumping Mask – we use this a lot… [During the dance] the middle one has to be a woman…with men on both sides. Collector George T. Emmons believed that this mask represented one of the spirit beings called Up River People who were portrayed in the traditional Deg Hit’an Mask Dance (Giyema). Phillip Arrow recognized it as a Jumping Man mask, a type of still used in contemporary dance. Similar to images of the Up River People, Jumping Man masks have long faces with round mouths. During the Jump Dance, two men wearing the masks dance beside an unmasked woman until they shout and jump over the feathered sticks that she holds in each hand. Phillip Arrow: This is called a “Jumping Mask.” We used this a lot, but I didn’t learn the song on it. Otherwise, I’d sing it too. Judy Woods: What do we call that? 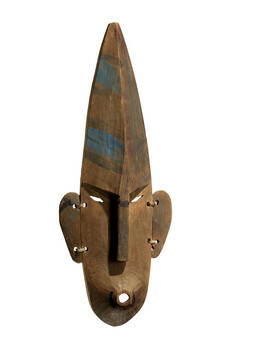 Phillip Arrow: Long ago they used to make lots of masks, giyema [mask]. (2) Jump means yi’a_tl’ik [he’s jumping]. Phillip Arrow: I don’t—the middle one [for a Jumping Mask dance] has got to be woman and men on both sides. And that woman, she goes like that [downward swing] with that stick. That stick, I made one before. Aron Crowell: Is this mask worn by the men who are on either side of the woman? Phillip Arrow: Only the men wear it, not the woman, the middle one. I don’t know why, because she’s got that stick I guess. When the woman threw that stick, the man said, “Koo-eee” [loud sound]. I don’t know what that means. When they jump, they say it. Suzi Jones: Phillip, when do they do this dance? In the winter? In the summer? Phillip Arrow: Winter, mostly winter. You know, they have a Stick Dance, like I’m talking about here. And that’s when they use that. Suzi Jones: And what happens in the dance? How do they dance with it? Phillip Arrow: It’s the same thing like we do. And when that woman is ready to throw that stick to that man, she do that [swings it down and across toward man]—that’s when the man jumps. Eliza Jones: How long is the stick? Phillip Arrow: The stick is about that [approximately 18 inches] long. And it’s made out of spruce. Eliza Jones: How big around [diameter]? Bigger than this [diameter of pencil]? Phillip Arrow: It’s about that size. There are four of them, spaced so it’s made round-like. And it’s tied together up here at the [top] end—all four of them are tied together there. And they put feathers on there, so the red sticks will go around and they tie feathers on it. Suzi Jones: Can you draw a picture of that thing the woman holds onto? Phillip Arrow: It starts right here, and it’s pointed to there and something like that [four point, elongated diamond shape]. They tie it together right there [at corners of longer length]. And there’s something right there [across narrower width] all the way across and another one [across length]. Eliza Jones: And then she holds it down here [at long end]? Phillip Arrow: Yes, the handle is down here. Eliza Jones: And maybe you could do the feathers too. Phillip Arrow: One feather, they peel it, up here [attached at opposite end from handle]. Eliza Jones: Oh, so it makes a stem. Phillip Arrow: Yes, and they tied the feathers right here [at top of stem]. Eliza Jones: This one [stem] would be wing a feather, right? Phillip Arrow: Yes. This one has got those red sticks too—just lines right here [4 extending from center to side on both sides]. Those ones, on the crosses [where sticks meet at center and sides], have feathers there too, same as up there [top]. Suzi Jones: Is there a name for that? Phillip Arrow: There’s the name for it, but again, I don’t want to mention it. Might be wrong. Eliza Jones: The person, I think you would want to talk to would be Ellen Savage. Phillip Arrow: Ellen, yes, that’s my big auntie too. Eliza Jones: I’ll show you the back. It’s [attachments] tied with . . . it looks like it’s hemp that’s been plied—twisted like tl’aah [sinew]. And would they make this with spruce? Phillip Arrow: Spruce, yes. I don’t know how they make it though. It’s not dry spruce. It’s got to be green, I guess, and then they dry it. Eliza Jones: The paint on there is green, and it looks like the red is kind of worn off, even on the sides. Yes, it looks like the ears were green. Most of the paint is gone. And around the chin, right along the lips, it’s painted with something dark red. I don’t think it’s tseeyh [ocher]. Phillip Arrow: The ones I’ve seen have green lines right here [from mouth to chin] too. Eliza Jones: Oh, down the chin. This one, there’s just a trace of paint going down this way [right side of mouth to right side of chin]. And it looks like over here [left side of mouth] it might have had some too, but most of it is worn off. Phillip Arrow: This, they paint it different ways. Eliza Jones: Green and dark red. Phillip Arrow: Sometimes they put black in there. This doesn’t look like paint, right? Eliza Jones: No, I think it’s Native paint, maybe mineral. Phillip Arrow: On the ones I’ve seen, there’s feathers. See this hole right here? Eliza Jones: Oh, there’s hole in the top. Phillip Arrow: Yes, there are feathers they put in there—wing feather from what I heard, and body feather. Eliza Jones: Oh, a bunch of little feathers. Phillip Arrow: Right, they tie it on. Phillip Arrow: I asked my mom, “How come its mouth is round?” “I don’t know, maybe it’s whistling,” she told me. [Laughs.] So I don’t know. Aron Crowell: Did you ever hear about spirits whistling instead of speaking? Eliza Jones: They used to tell us not to whistle outdoors in the evening, because that’s how the spirits communicated, yes. Trimble Gilbert: Maybe the way he’s whistling, that means something too. Trimble Gilbert: In my time, a whistle is—when there’s long northern lights outside, when you whistle, there’s more like that coming down like that. It had something to do with animals too, that northern light. When there’s a lot of caribou in one area, there’s a lot of northern lights above that area. Eliza Jones: Yes, and come down low over. Trimble Gilbert: Yes, come lower—something to do with keeping the animals warm or something like that. Eliza Jones: It must attract the heat or something. One of the Elders around home said when he was a boy, they were moving around, traveling around looking for caribou and they made camp. Trimble Gilbert: And we get lots of northern light up where I live. A lot of the time when I’ve been trapping, I travel at nighttime and evening and it’s still bright because there’s lots of northern light. And there are a lot of long stories about northern light too. Sometimes it’s red northern light and that means something. 2. This statement is from the discussion of mask E339831. Elder Phillip Arrow from Shageluk, however, recognized this piece as a Jumping Man mask, worn for the Jump Dance that was performed during the Giyema. This type of mask is still made and used in contemporary dance performances. Similar to images of the Up River People, Jumping Man masks have long faces with round mouths, and some are painted with horizontal bands of color. (4) During the Jump Dance, two men wearing this mask perform on either side of an unmasked woman, and at a certain moment they shout and jump over the feathered sticks that she holds in each hand. The Mask Dance, Bladder Festival, and other traditional ceremonies that were held each winter by the Deg Hit’an in their villages along the Yukon, Innoko, and upper Kuskokwim rivers were unlike those of any other Athabascan group. (6) On the other hand, these ceremonies were very similar to those of neighboring Yup’ik communities with whom the Deg Hit’an had close and generally peaceful ties, and from whom they apparently adopted many customs. (7) Deg Hit’an ceremonies took place in a kashim, or community center and adult male residence that was nearly identical to the Yup’ik qasqiq [men’s house]. Deg Hit’an masks represent humans, animals, and mythical beings. A wide variety were worn during the two-day Mask Dance and the 17-day Animals’ Ceremony (or Stick Dance), both held to increase the abundance of animals. (8) Each man carved his own masks and composed songs about them, inspired by his personal dreams. (9) The original method was to burn blocks of green spruce wood into approximate shape before carving the mask’s features with a beaver-tooth knife.